It is so much fun to create something out of ordinary things. 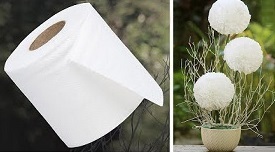 We all have toilet paper I suppose and if we also have some free time and the willingness of spend it with fun – than we would like you to check out this tutorial. You are going to learn how to make a rather beautiful flowers (we don’t know the exact name of the breed) in the matter of minutes, using some sticks and paper flower only. The video tutorial explains it all. We are going to embed it in the post. Make sure to comment your thoughts and return for the DIY tutorials alike.